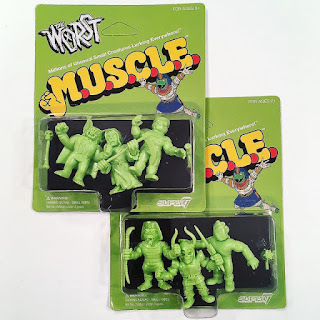 Super7 has been releasing a lot of new, officially licensed MUSCLE figures lately. Last time we covered their Alien MUSCLE. This post will spotlight another new set based on an original concept called The Worst. 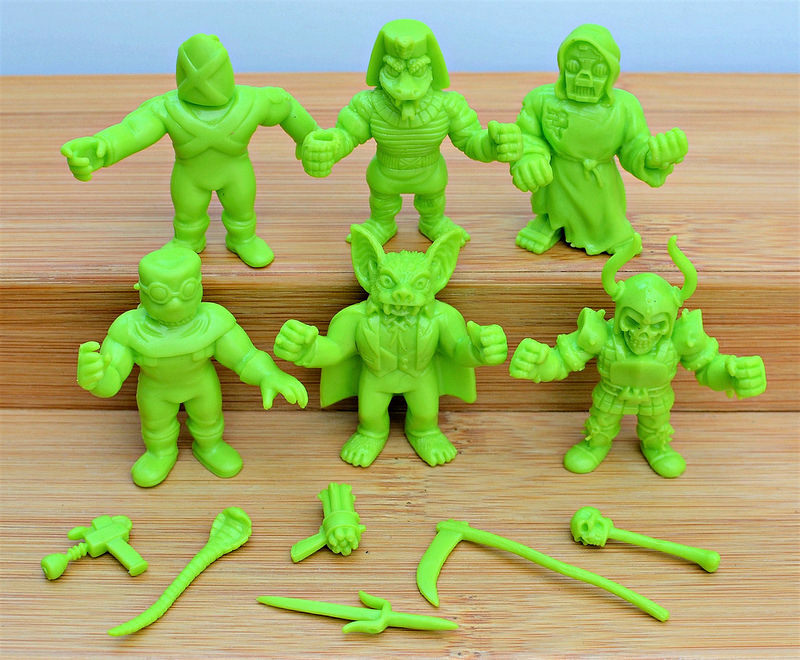 Despite their name, they just might be the "best" Super7 MUSCLE figures yet (har har...). 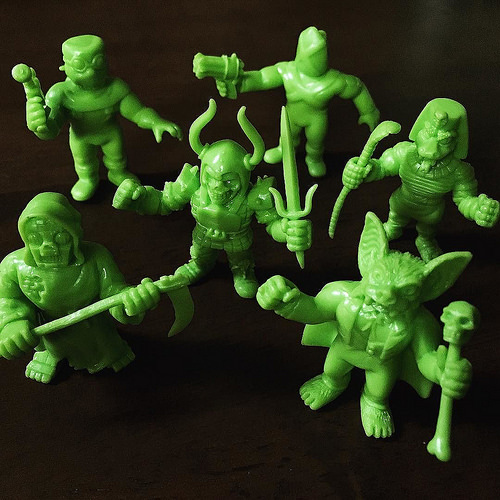 Before being given the MUSCLE treatment, these baddies were produced as the retro-styled action figures Super7 is probably best known for. I don't collect that style of figure, but when I saw these unleashed in MUSCLE form I could not resist. So far, The Worst MUSCLE have only been released at San Diego Comic Con 2017 in special blue and green color 3-packs, including the purrty light green color seen here. The remaining SDCC stock was sold on the Super7 website (and pretty quickly sold out) after the convention. I assume there will be standard releases in other colors, such as the usual MUSCLE flesh color, but to my knowledge no details have been provided yet. I think my favorite is maybe Robot Reaper. Or Snake Tut. Or Black Falcon. Gah...I can't pick! I like them all. I am very impressed by the sculpts on these. They are really, really well done. And to add to their coolness, each figure comes with a removable weapon! You don't see mini figures with removable weapons too often. This feature is well-executed, too -- each character's weapon fits well in its hand. I hope that The Worst MUSCLE are a hit so that additional series and characters can be produced. I love the idea of a toy line consisting of only original bad guys. The bad guys are always the coolest anyway, right? What about you? Do you plan on picking up any The Worst MUSCLE? these are so much nicer then the last Mega Man pack! Yes, I was pleasantly surprised. Not sure what happened in production with the Mega Man ones, but these have none of the same issues. I would definitely get these boogers if they were easily/widely available. 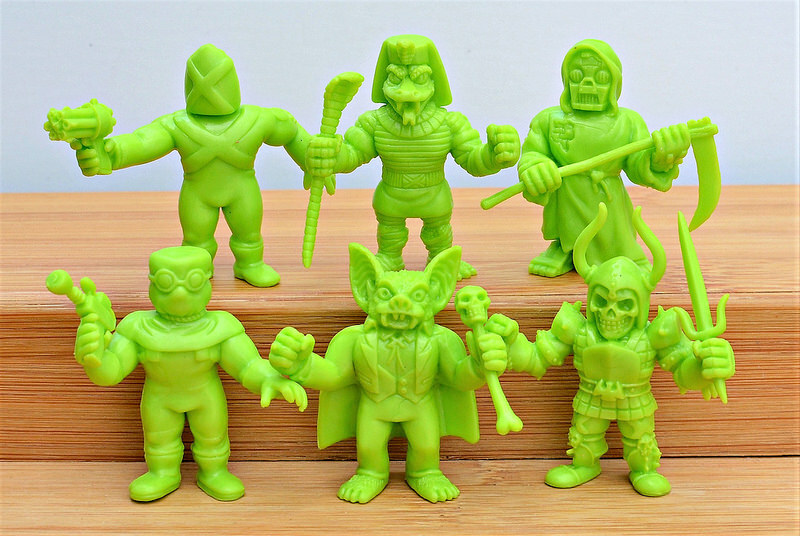 Also like the green color scheme and sculpts a lot. Their personality really comes through in your pictures quite well. Maybe it's the color but they feel like a blend between SLUGS and MUSCLES, which I don't find to be a bad thing at all. I assume they will have a wide/general release very soon, though this color was SDCC exclusive. I'm guessing they'll release them next in the standard MUSCLE flesh/pink, which I don't find as interesting, but many people seem to like for nostalgia reasons.